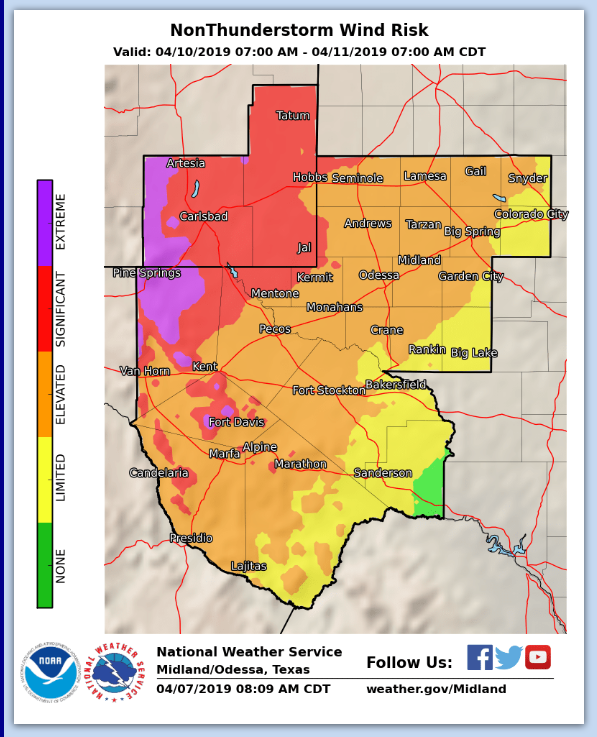 Record Heat Tuesday - High Wind/Blowing Dust Event Wednesday - Late Week Winter Storm. 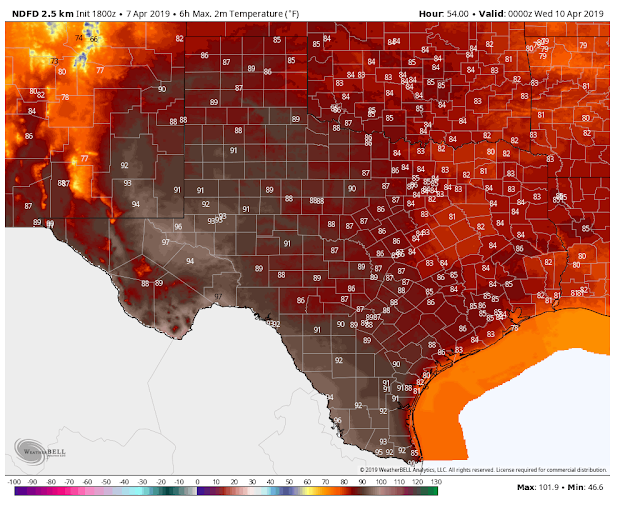 NWS NDFD Forecast High Temperatures Tuesday. Near record to record high temperatures will occur Tuesday afternoon. Our highs are currently forecast to be in the low to mid 90's. Some parts of West Texas (Pecos, Fort Stockton areas) will be as hot as the Phoenix, Arizona area with highs in the mid to upper 90's. I wouldn't be too surprised to see a few stations come in at the century mark. 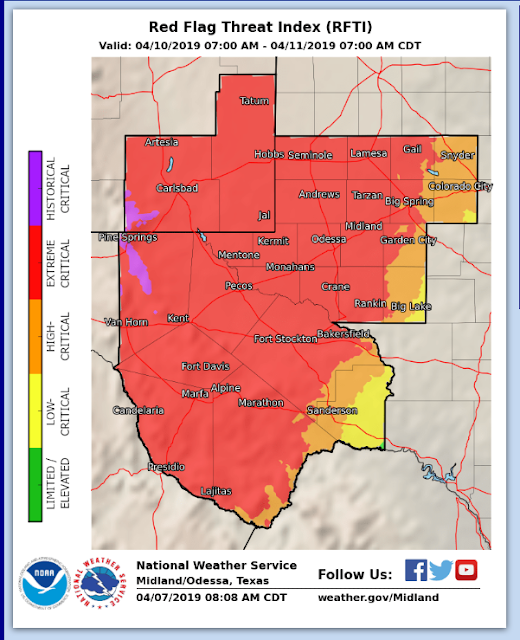 Hot dry downsloping southwesterly winds, very low relative humidity values (single digits), combined with the hot temperatures (15 to 20 degrees above normal) and very dry conditions will elevate the Fire Weather Danger Tuesday to Critically to Extremely Critically Dangerous levels. Southwesterly wind gusts up to around 20 to 40 mph locally with the higher gusts over and near the mountains. These conditions will worsen on Wednesday with the higher winds. Extremely Critically Dangerous Fire Weather Conditions Wednesday. Courtesy Of The Midland National Weather Service Office. Ugly Weather Shaping Up For Wednesday. Wednesday has the potential to get really ugly as far as high winds and the Fire Weather potential are concerned across the local area. 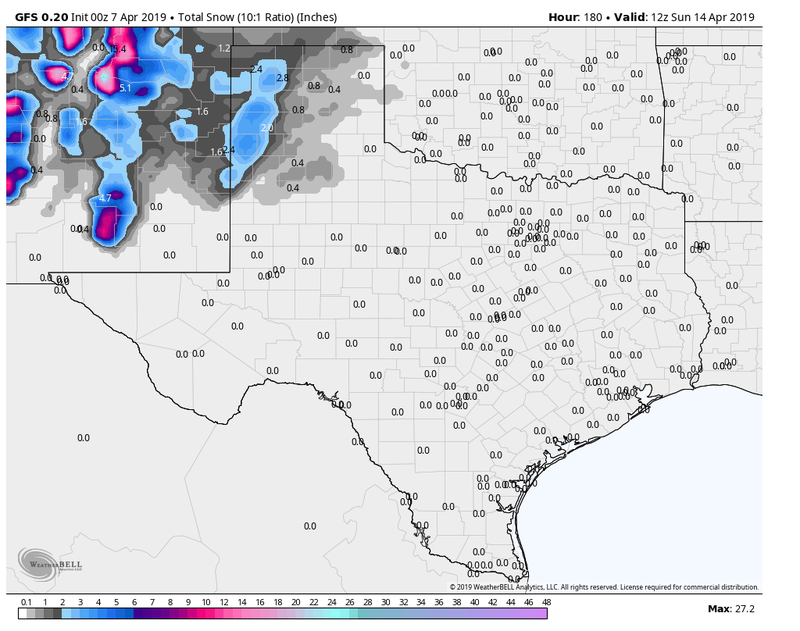 Current model forecasts are generally calling for potentially damaging southwesterly winds to become sustained at around 40 to 50 mph with gusts to around 60 to 70 mph across the Southeastern New Mexico plains, and parts of southern New Mexico, and West Texas by late morning or early afternoon. These winds could gust as high as up to around 70 to 85+ mph in the Guadalupe Mountains, as well as the Sacramento and Capitan Mountains on Wednesday. We will need to pay attention to later forecasts to see if these winds could even be stronger than currently forecast. High Winds & Blowing Dust. Valid At 6 PM MDT Wednesday, April 10th, 2019. A strong closed low is forecast to swing across Colorado on Wednesday. Given the northerly track of this potent upper level storm this means we get sideswiped with the bottom of the storm which means high winds. Areas of blowing dust will likely become widespread in the afternoon. During the higher gusts there may be sudden drops in the visibility down to near zero with little to no advanced warning. This will be especially true over and near orchards with exposed bare ground, freshly plowed or open farmlands, fields, and construction sites. Remember these areas pose a high danger to anyone traveling through them should they encounter these blinding clouds of dust. The area has a history of multiple vehicle accidents with injuries and fatalities during these major high wind and blowing dust events. High winds may also pose travel problems on some of our local highways with the possibility of some of them becoming closed due to the high winds and blowing dust. Some structural damage may occur during the higher gusts if current forecasts verify. This includes power lines and other utility lines being blown down. Power poles and other utility poles being blown down. Some roof damage including shingle damage may occur. Small sheds and outbuildings could be blown down. Some high profile vehicles could be blown over of off local highways. Some west facing buildings may have their windows blown out. 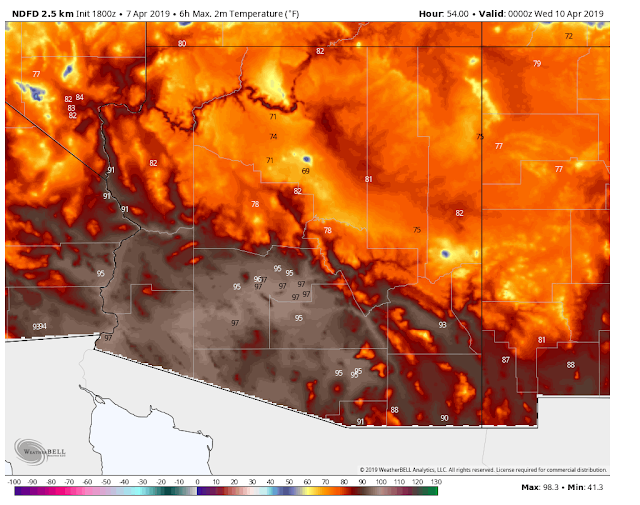 Extremely Critically Dangerous Fire Weather Conditions. 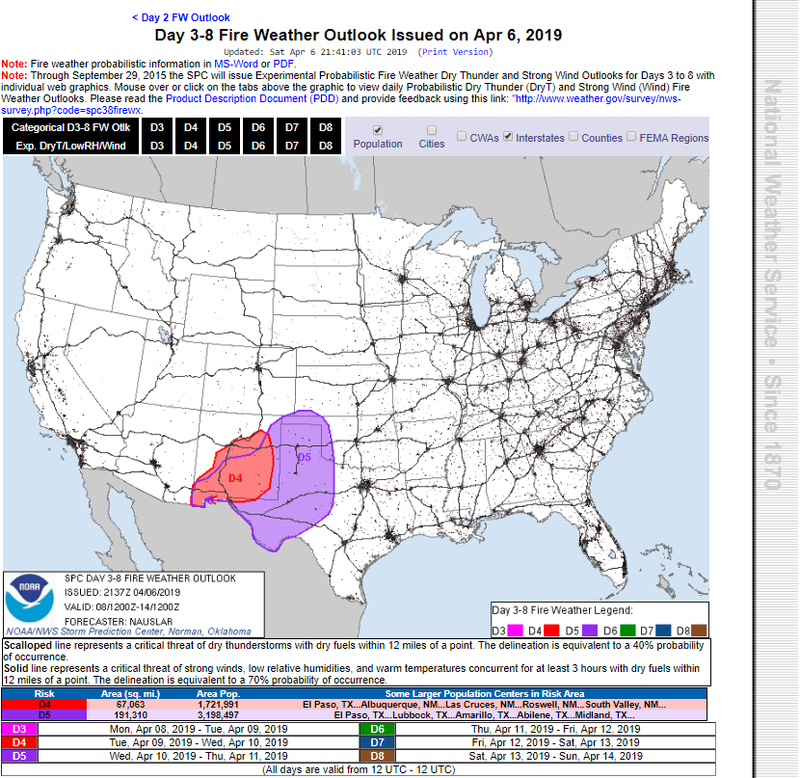 Storm Prediction Center Fire Weather Outlook. Extremely Critically Dangerous Fire Weather Conditions are forecast for the area Tuesday into Wednesday. This means that any wild fire, range fire, forest fire, or grass fires that break out Tuesday and especially Wednesday will have the potential be long lived and may rapidly spread and grow and will be extremely difficult to control or put out. Blinding clouds of smoke could possibly combine with the blowing dust and drop the visibility on some local roadways to zero should a fire break out near a road or highway. Any outdoor activity that may involve the use or create sparks or flames is not recommended Tuesday and especially on Wednesday. The area has a history of destructive wild fires that have burned thousands of acres of grasslands and forests. Homes and other properties have been lost and tragically even some lives. Livestock and wildlife unable to outrun the fires have also been lost. Just how dangerous this situation will become will be highly dependent upon just how strong the winds become. 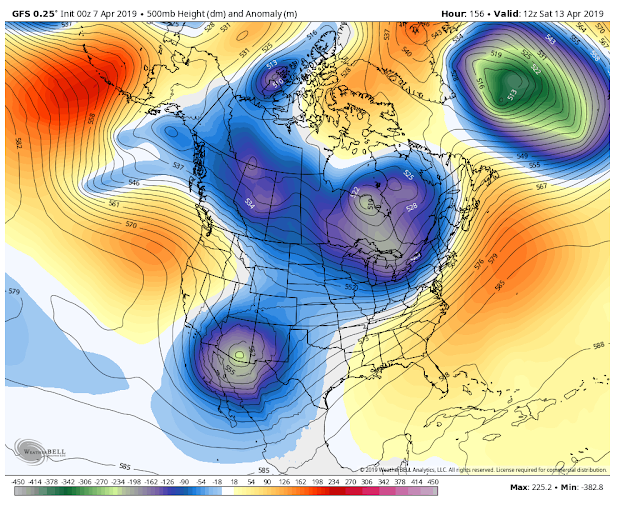 Major Winter-Like Storm Late Next Week? 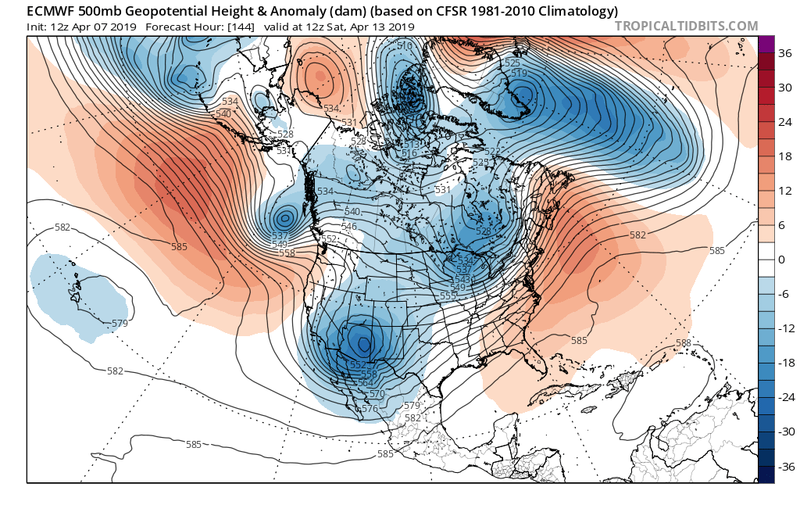 This Mornings 12Z/6 AM MDT European (ECMWF) 500 MB (18,000' MSL Forecast. 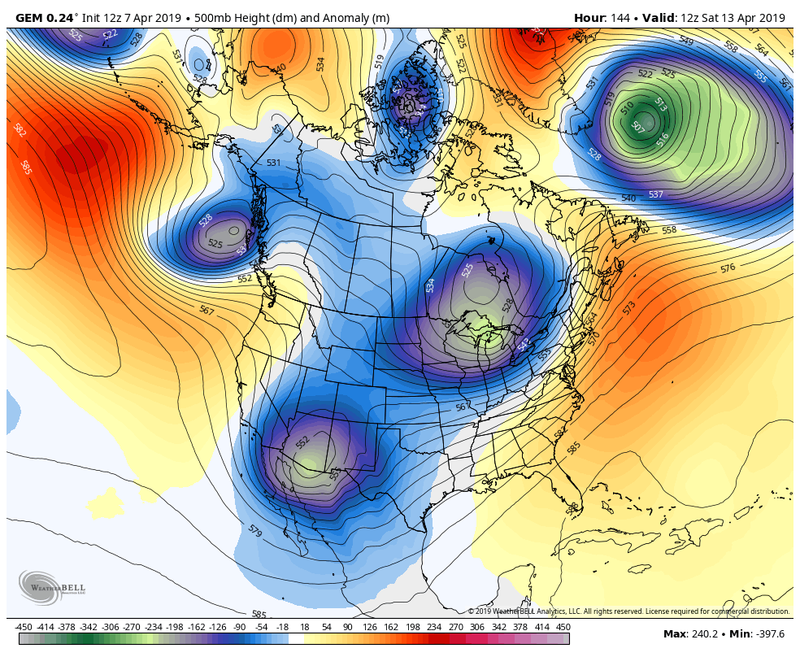 Valid At 6 AM MDT Saturday, April 13th, 2019. This Mornings 12Z/6 AM MDT Canadian (GEM) 500 MB (18,000' MSL) Forecast. Last Nights 00Z/6 PM MDT GFS 500 MB (18,000' MSL) Forecast. Lots of questions and unknowns concerning late next weeks potential winter storm. Exact track and timing will play crucial roles in who returns to winter. Not shown in this blog post will be the potential for severe thunderstorms associated with this storm. 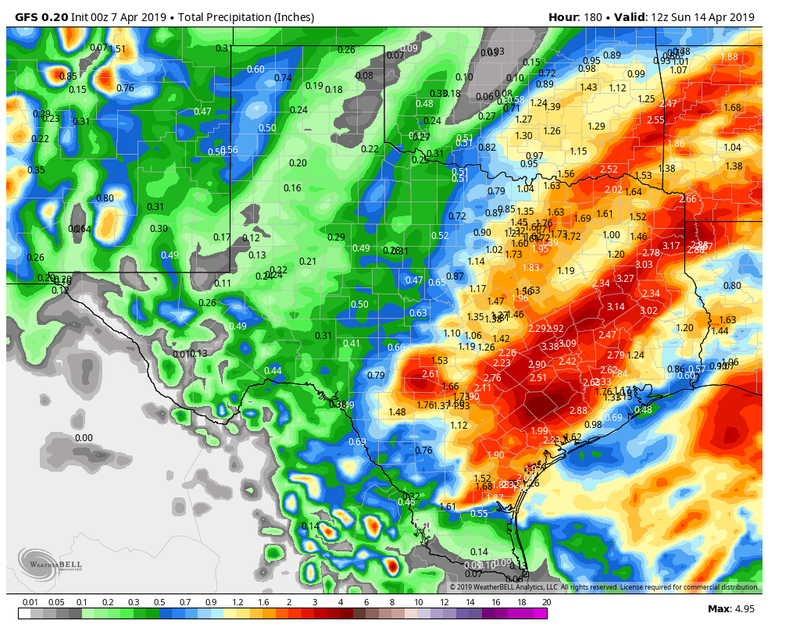 Even the possibility of a major severe weather outbreak. More on that later. This mornings run of the GFS model just fell off the edge of the cliff compared to its previous runs or forecasts concerning this storm. It completely opens the storm up as a long wave trough of low pressure instead of a closed low depicted by the Euro and Canadian models. So I chose last nights run instead of this mornings run shown above. 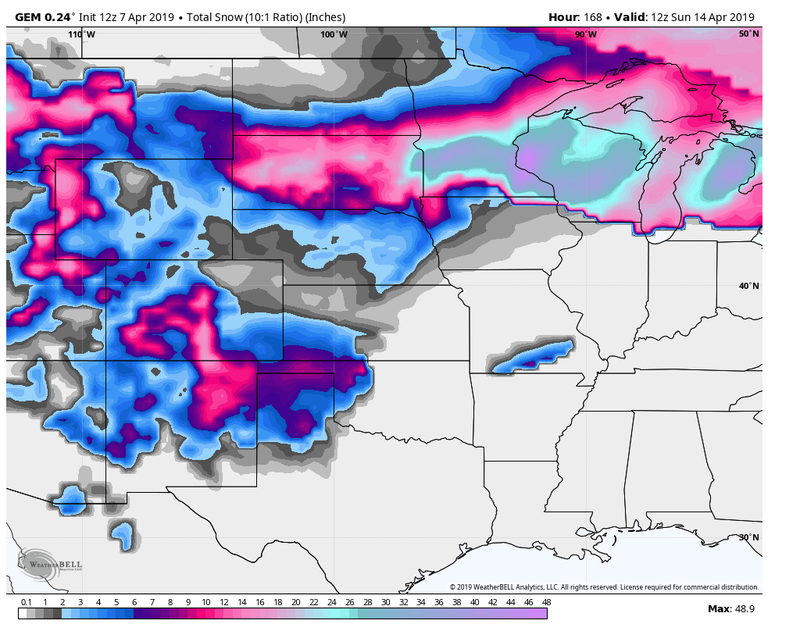 Should this potent and cold upper level storm keep the southern track and go near or south of New Mexico then much of the area may see accumulating snowfall late next week into the weened. How much and where is impossible to pin point this far out in time but its something to keep in mind. Use the following precipitation and snowfall forecasts with a huge grain of salt until late next week when the models hopefully settle on the storms track, speed, and strength. 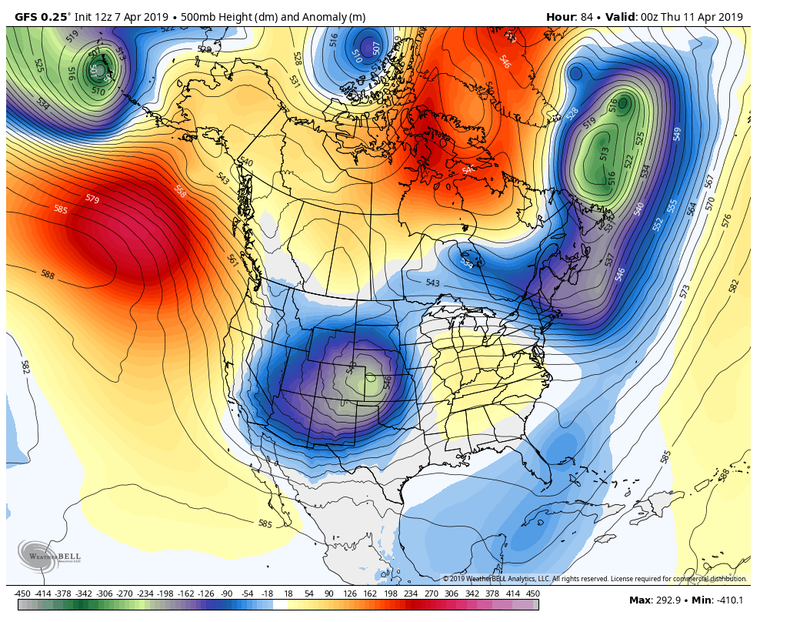 Late next week has the potential to see some wild weather both here and near New Mexico and across nearby states. 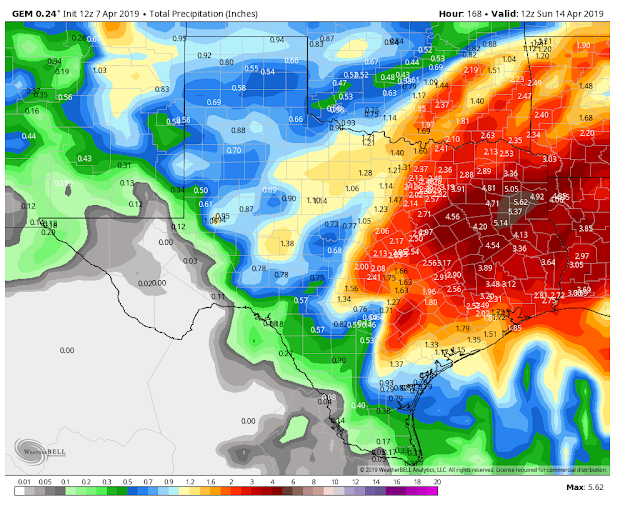 Keep in mind that these forecasts will change with time. This Mornings 12Z/6 AM MDT Canadian (GEM) Forecast. Valid At 6 AM MDT Sunday, April 14th, 2019. 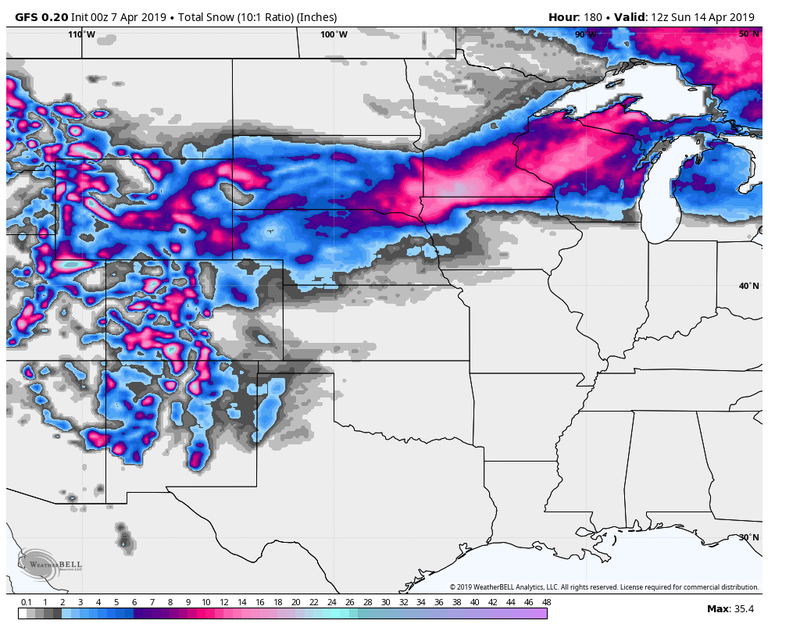 Last Nights 00Z/6 PM MDT GFS Forecast. 36 years ago a late winter-like storm hammered the local area and reminded us that winter was not through with us. Some incredible snowfall totals were recorded for anytime much less the first of spring. April 5th - 8th, 1983 Snow Storm Totals. Capitan- Total Snowfall 35.0", Total Precipitation 1.49", Max Snow Depth 18" On The 4th, Lowest Temperature 14º On The 5th And 8th. Cloudcroft- Total Snowfall 32.6", Total Precipitation 1.32", Max Snow Depth 32" On The 8th Lowest Temperature 7º 5th. Ruidoso- Total Snowfall 24.3", Total Precipitation 2.01", Max Snow Depth 23" On The 6th Lowest Temperature 2º 8th. Hope- Total Snowfall 22.5", Total Precipitation 2.26", Max Snow Depth Missing, Lowest Temperature 22º 4th. El Paso- Total Snowfall 16.5", Total Precipitation 1.42", Max Snow 9" On The 7th, Lowest Temperature 23º On The 8th. Lakewood- Total Snowfall 15.9", Total Precipitation 1.56", Max Snow Depth 9" On The 5th And 6th Lowest Temperature 17º 8th. Artesia- Total Snowfall 15.5", Total Precipitation 2.04", Max Snow Depth 7" On The 6th Lowest Temperature 16º On The 8th. Mountain Park- Total Snowfall 15.0", Total Precipitation 1.07", Max Snow Depth Missing, Lowest Temperature 17º On The 5th And 6th. Tatum- Total Snowfall 12.5", Total Precipitation .59", Max Snow Depth 7" On The 5th, Lowest Temperature 21º On The 1st. Carlsbad- Total Snowfall 11.7", Total Precipitation 1.06", Max Snow Depth 4" On The 6th And 7th, Lowest Temperature 20º On The 8th. 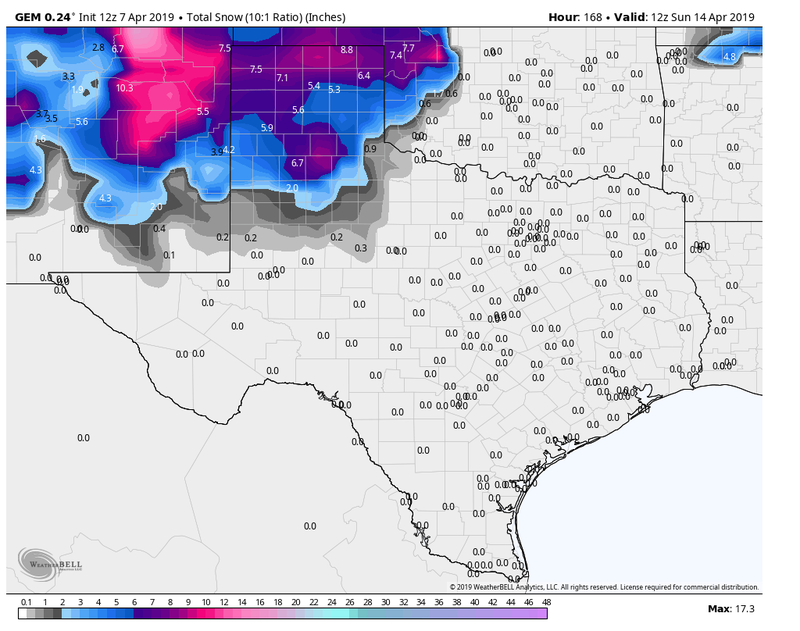 Hobbs- Total Snowfall 9.0", Total Precipitation .60", Max Snow Depth 6" On The 7th, Lowest Temperature 25º On The 8th. Maljamar- Total Snowfall 8.5", Total Precipitation .66", Max Snow Depth 4" On The 4th, Lowest Temperature 25º On The 9th. Carrizozo- Total Snowfall 8.0", Total Precipitation .36", Max Snow Depth 8" On The 4th, Lowest Temperature 21º On The 2nd And The 5th. Las Cruces- Total Snowfall 7.0", Total Precipitation .68", Max Snow Depth 5" On The 6th, Lowest Temperature 27º On The 14th. Roswell- Total Snowfall 5.3", Total Precipitation .61", Max Snow Depth 2" On The 6th And The 7th, Lowest Temperature 25º On The 4th. Alamogordo- Total Snowfall 3.5", Total Precipitation .74", Max Snow Depth Missing, Lowest Temperature 28º On The 9th.